Lil' Blog and More: Review : Lafayette Puzzle Factory- Chalkboard Floor Puzzle. 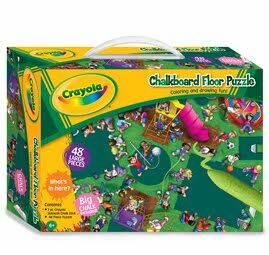 Review : Lafayette Puzzle Factory- Chalkboard Floor Puzzle. The Chalkboard Floor puzzle from the Lafayette Puzzle Factory is so great and interactive. As most of you know, I babysit alot for my neighbors. I was going to give this to Marisol, but it is recommended that children should be over the age of 6 to use this. So I decided to give it to my neighbor, Kaylee. Kaylee is a really good girl, shes a little on the wild side, but has a good heart. I always enjoy watching her. So, this past weekend I had to watch her. I honestly had a major headache and did not feel like running and jumping around, so I brought the Chalkboard Floor Puzzle over with me. As soon as I said the word puzzle to her she threw a fit, she thought it was a "grown up" puzzle and did not want to put it together. But I told her if we opened it and she didn't want to do it then she didn't have to. Reluctantly she agreed. So I opened it up she got started. There are only 48 pieces in the puzzle, so it was not too overwhelming for her. She is a little impatient, so she had me help her with a few pieces, but I was happy to see her really work hard at getting it done. Once she was finished she was so happy; She was running around saying "I finished it, I finished it" I don't think she had realized it was a chalkboard to, so I gave her the chalk and her face it up. First she thought I wanted to play 4 square (lol) but then I explained and she ended up drawing on it all night. We played hangman, and pictionary. Overall it was a quite night thanks to the Chalkboard Floor Puzzle. I was really impressed with the Chalkboard Floor Puzzle. 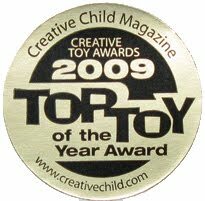 Not just because it is an awesome product, but also because it won an award in 2009 for being the top toy of the year, now thats impressive! If you are looking for a great toy for your child (aged 6+) then I really recommend the Chalkboard Floor Puzzle from the Lafayette Puzzle Factory. Disclosure: Review product was provided to me. No monetary compensation was received. All opinions expressed were mine and were not influenced in any way. What a great idea for challenging and creative activity. My girls would love that. Thanks for the gift idea. I was just swinging by to invite you to our Spotlight Saturday blog hop. Link up your own blog plus one you'd love to share with the rest of us! I hope you have a great weekend! I would love to win this. My daughter loves putting together puzzles and drawing so this would by perfect.